We create brand experiences that tell a story, triggering a positive culture amongst your staff and audience, extending your brand’s personality in an immersive, creative and engaging environment. 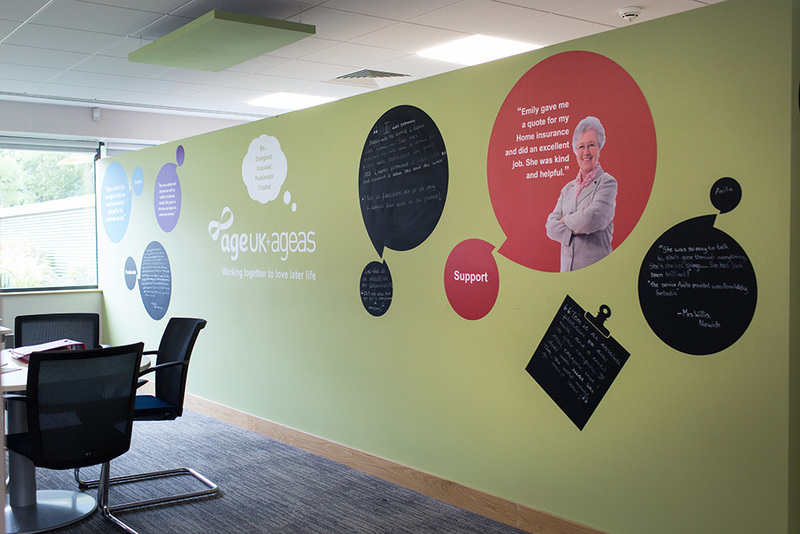 With Ageas we had the perfect opportunity to extend the brand’s personality in an immersive, creative and engaging environment and make the office into a workplace that employees were excited to go to everyday. We needed to take this approach in order to overcome the challenge of reducing a high turnover of staff – notorious in call centre environments. What followed was a revolutionary transformation that propelled this national insurer as a front runner in employee retention. Transform an environment into an experience. Ageas are part of an international group which traces back to 1824. That’s almost 200 years’ experience in insurance. Ageas UK has grown by building partnerships with other trusted and high-profile organisations, large and small. 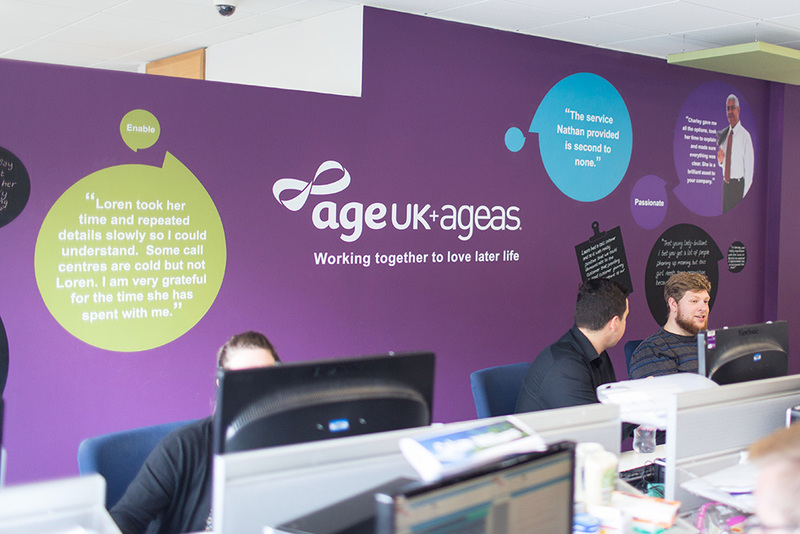 Because they share the same values and want to make life easy and straightforward for customers, Ageas wanted to join forces with Age UK and take over the call centre, and this is where the Ageas and Global dynamite duo began. Attract, immerse and influence with rewarding results. 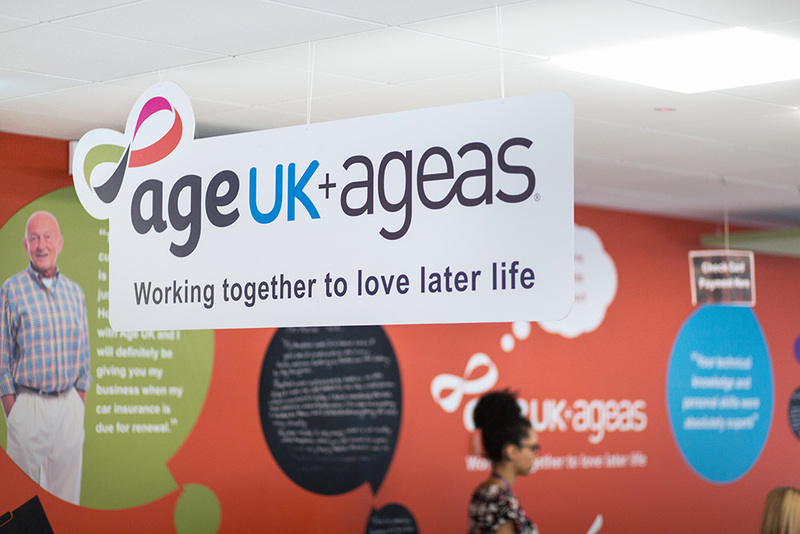 Ageas wanted to demonstrate to Age UK that they were serious about their partnership and really understood their target audience. 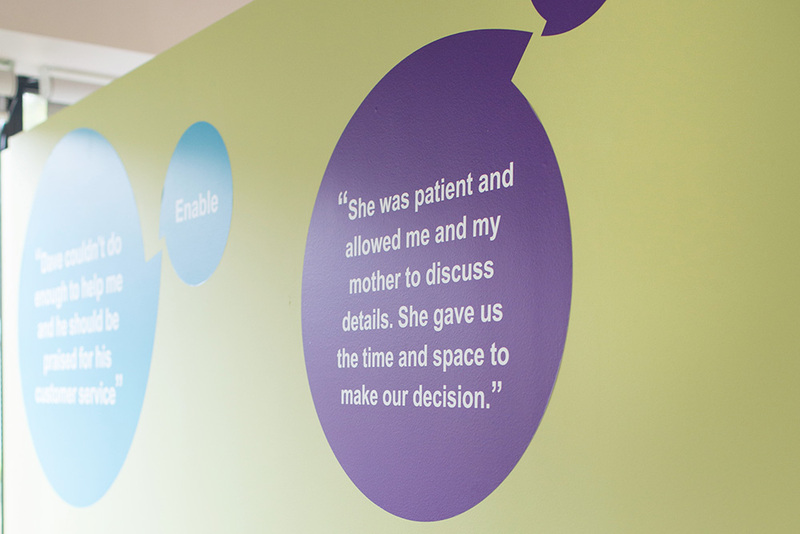 Global’s approach was to bring the Age UK customer to life and create life-size customer personas. 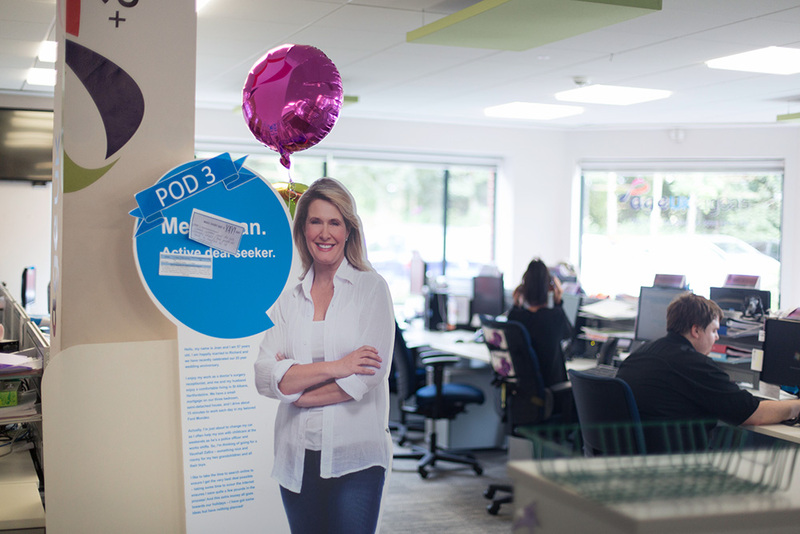 Global undertook a rebrand renovation of the call centre in a bid for employees to truly engage and understand who their customers were. In addition, there was a reward and recognition initiative implemented for employees to complement their colleagues and write down any good feedback from customers. This was created to build relationships between staff and to encourage recognition of everyone’s efforts. This initiative broke down barriers, created dialogue and brought together a large team working in a challenging environment. “We have enjoyed a strong relationship with Global for almost 10 years and since we found them it quickly turned into a partnership. The quality of work, pricing and reliability far exceeds expectations. 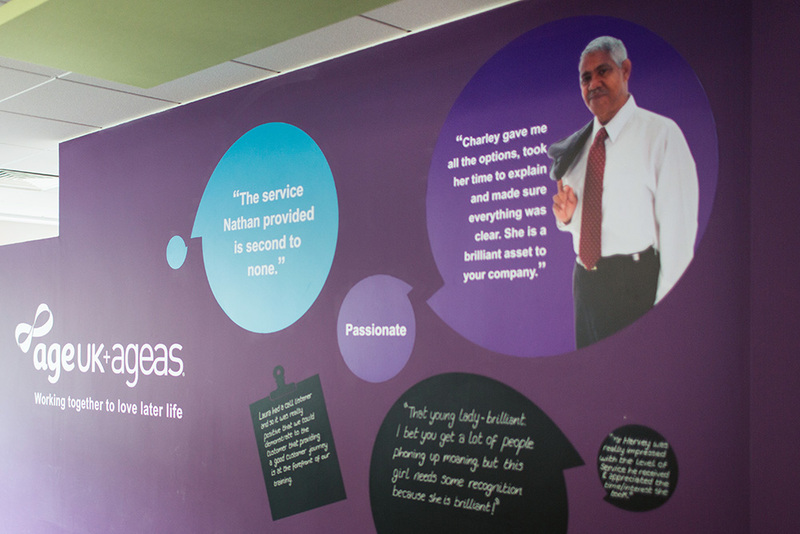 Over one weekend, the call centre was transformed into Ageas Street. It was a creative concept that brought all of the different brands and customers to life. The immersive environment gave a sense of ownership and accountability for the brand that employees were representing. 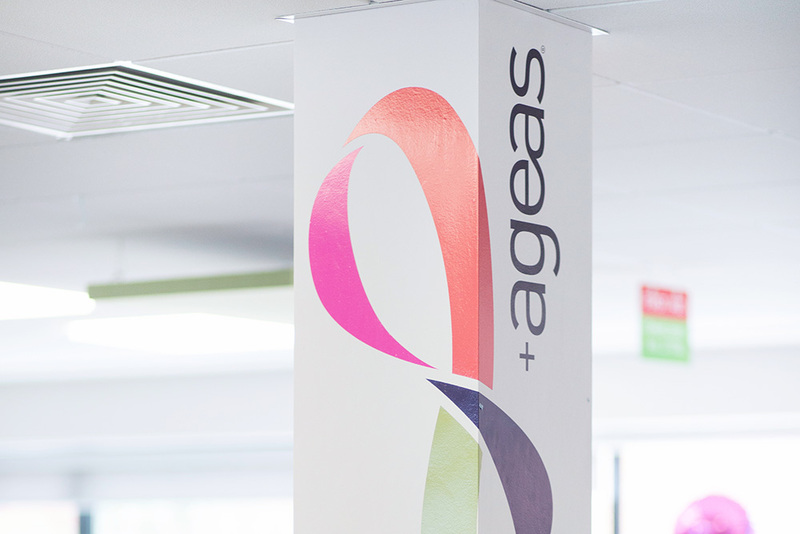 On the back of the success of the Ageas Street concept, Ageas expanded this business model by rolling it out to their Stoke office. This particular office housed 700 employees, servicing a whole host of different brand clients.